This music video is completely awesome, and that is why I'm covering it on my blog today, even though I'm going to have to deal with this awkward title that I can't possibly type out on my English keyboard - why do I always make it difficult for myself. This track is addicting, but it's the music video that really allows this Eurovision 2017 singer to shine. It excites me, as it proves he has a bright future in every way. 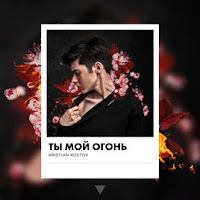 Watch Kristian Kostov perform, dance, and act alongside an actress as they transform his new song into a stunning visual in this music video for "Ты мой огонь". Kristian Kostov is best known for coming second in the Eurovision Song Contest 2017 with his song "Beautiful Mess"; he represented Bulgaria and scored 615 points. That certainly launched him internationally, but before then he appeared on Golos. Deti (The Voice Kids Russia) where he got to the finals coming joint fourth. Not long after that, he competed in The X Factor Bulgaria, once again he got to the finals and came second overall. He's been a big hit in Bulgaria and has had a couple of hit singles. His Eurovision song sure launched him as an artist, but he has since released songs in his home language of Russian, just like this one. "Ты мой огонь" means "You Are My Fire" in English and regardless of the fact that I don't understand a word he is singing, the song is beyond catchy and shows exactly why he deserves to be an international star. The song was written by Vadim Igorevich Bulaev, and Daniel Kostov. Directed by Vasil Stefanov, this music video has a lot of Nick Jonas and Tove Lo "Close" vibes going on, but in a more warped sense. There is a clear connection between the pair, but they don't quite get together, almost like they're playing the game, just like the lyrics suggest. It's really clever the way they've managed to interpret the lyrics and made this addicting visual - I only know this as I used a rough Google Translation of the lyrics to understand what Kristian Kostov was singing. The dancing is on point throughout, and it is amazing to see Kristian Kostov fully nail the routine. The choreographer was Milen Dankov and he also came up with the concept that really makes this whole thing work. We all wish we could dance like that; Milen Dankov please come to the UK and teach me! The performance piece includes Kristian Kostov's face being projected on his real face, with some awesome smoke effects too. This really shows off his stage presence, which we also saw at Eurovision 2017. He brings the fire, just like he does during the dance sequence. Overall, the music video has a big concept that totally relates to the lyrics in every way. This is one of those visuals that continue to impress every time you watch it. It's one I will never get tired of, and one that works perfectly with the song! Even if you haven't got a clue what the lyrics of the song are about, the characters sure gives a great representation, instead.